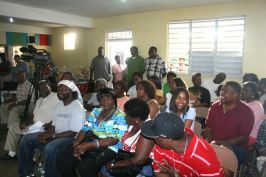 Roseau, Dominica – April 10, 2008……… Prime Minister, Hon. Roosevelt Skerrit has reiterated his government’s commitment to the construction of an international airport in Dominica. The Prime Minister also told the large gathering of overseas-based Dominicans that the process towards building an international airport would take years, describing it as “a massive undertaking”. In the meantime, Government is pursuing the development of the Melville Hall Airport as a short to medium response to inadequate air access into Dominica. Hon. Skerrit also revealed that several interested parties had expressed an interest in assisting in the construction of the international airport. Hon. Skerrit also mentioned that coming out of the recent 19th CARICOM Inter-Sessional Meeting in Trinidad, the Government of Trinidad and Tobago had established a special facility for the OECS, specifically to assist the Commonwealth of Dominica and Saint Vincent and the Grenadines in the construction of an international airport in their countries.